VTouch Classic switches flawlessly combine extraordinary design and innovative technology to transform your home or office into a unique space that is perfectly you. These customized glass touch switches will add an extra element of luxury to any interior while giving you even more control then typical electric switches. Our digital switches combine impeccable design and sophistication with reliability and safety. 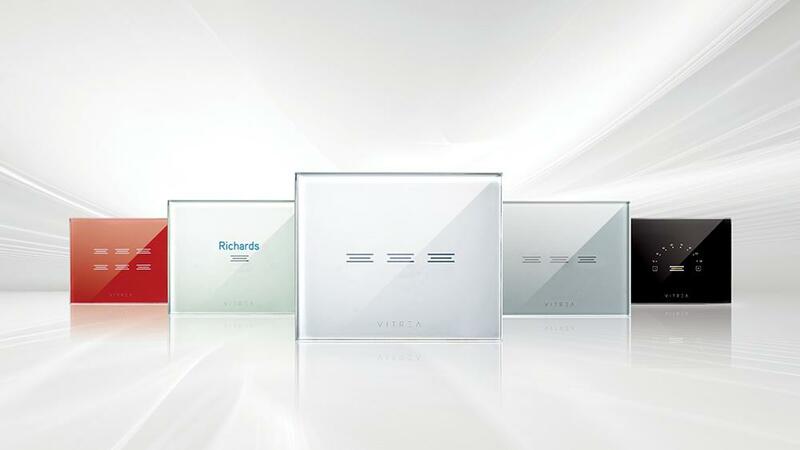 Vitrea's blend of touch control technology and electronic switches offers a wide variety of unique features that cannot be incorporated into a simple mechanical switch. Touch technology makes these switches easy to use and having the option to set your own predefined lighting conditions mean ambience is just a press away. Our signature adjustable blue LED lighting softly glows from the switch to offer convenience even in the dark. Create a sophisticated ambiance with the touch of a button. Brighten or dim the lights to match any mood and occasion. Whether you want a bit of privacy or plenty of natural light pouring in through your windows, one touch will allow you to control your blinds or shutters. With custom colors, personalized laser engraving and gently illuminating blue LED lights, welcome your guests to your home with an experience of elegance and sophistication. Create a memorable touch experience for your guests. Add a finishing touch of elegance to your electric water heater switch that not only looks sleek but functions as a digital timer allowing you to set its operation in 15-minute increments. Beautifully stylish, these glass touch switches add elegance and sophistication to the visual design of any interior space by simply replacing mechanical switches with digital ones. Set flush to the wall or floating just above it, you’ll see no design detail has been left to chance. Created to be as unique as you are, choose from our classic color options or custom match the switches to any color you want. Tailor your look even more with personalized engraving on every switch. These switches are as easy to use as any regular, plastic switches and with each button engraved, you’ll always know how to control your home. Electricians quickly and simply install Vitrea's glass touch electric switches, similar to the installation of a mechanical switch or just replace existing mechanical switches with ease. Vitrea uses only the highest quality components to ensure maximum reliability and dependability. Safety is paramount so rest assured; these switches fulfill all international safety and quality standards. When you’re ready to take your space to the next level with wireless smart home technology, you can easily replace your VTouch Classic switches with wireless VTouch Pro switches and enjoy a complete smart home system.